1. Members must go to www.photobookphilippines.com/cpg/mabuhaymiles, enter name and email address to activate the code. 2. Download the Photobook App, upload your photos and pay for shipping to complete your order. 4. Offer can be availed from March 25, 2019 to March 31, 2020 only. 5. 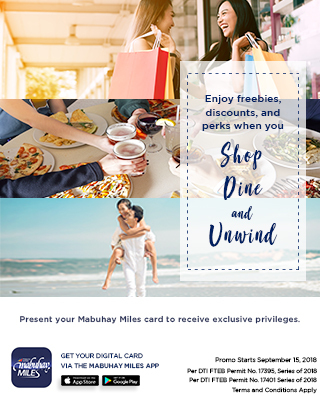 Voucher code MABUHAYMILES2019FREE for the 6x6 Simple Book is valid for the Photobook app only. 6. Voucher code is valid for single use only. 7. Shipping is not yet included. Delivery is within the Philippines only. 8. Additional pages and paper upgrades are not included and have corresponding charges. 9. All Photobook items are fully customizable/personalized using the Photobook mobile app. 10. Offer is non-transferable and non-convertible to cash or gift certificate. 11. Offer cannot be used in conjunction with other ongoing promos or discounts of the participating merchant.